Here's tutorial of how to download and watch movies on Windows 10 store. The new features of Windows 10 give users a very persuasive reason to free upgrade to Windows 10 and even tempt a part of people to switch other OS to this new Windows system. Among those new features, the versatile Windows 10 app store totally satisfies people who pay much attention on entertainment and brings an ultimate shopping experience across Windows 10 devices. And here, what we will talk about is how to stream movies, music from Windows 10 PC to devices like Windows phone/tablet, Xbox with movie/music streaming apps in Windows 10 store. WinX YouTube Downloader - Free download full movie videos/trailers, music videos/albums/playlists in 720P, 1080P, even 4K/8K/3D from YouTube and alike sites (300+) on Windows 10 in a flash. If you have installed Windows 10, open Windows Store and you can discover tons of built-in apps ranging from daily use like Office, OneDrive, Mail to entertainment including games, movies, music etc. Besides, you can download third-party apps you want from Windows 10 app store. Now, let's go to check the best Windows 10 movie/music streaming apps and learn how to stream movies/music from Windows 10 PC. Before the release of Windows 10, Microsoft had announced a Movies & TV app which derives from Xbox Video in Windows Store enabling users to play and manage personal movies (like copied from DVD with a DVD ripper, downloaded online, home-made, purchased/rented from Xbox Video/Windows Store) as well as stream movies from Windows 10 PC to devices, like Windows Phone/Tablet. It is now available in 21 countries and supports over 100 languages. 1. Play a video in the Movies & TV app. 2. Tap "Cast to Devices" button at the bottom of the screen. 3. The DLNA/UNPnP devices on your network will be listed. Select one device and then it will start streaming movies from Windows 10 PC to the remote device. • Explore and watch plentiful movies, TV episodes. • Start from $7.99 /month for this movie streaming service for Windows 10. >> Fix Netflix Errors • Offer unlimited current hit, classic TV shows/series and movies, including those for kids. • Check upcoming movies, showtimes, reviews, HD movie trailers. 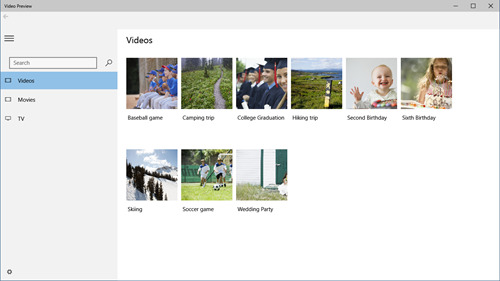 • Stream full-length movies from your collection on Windows 10. • Deliver full-length Hollywood movies, TV series. Groove Music, aka Xbox Music, is a new launched music streaming app on Windows 10. Embracing over 40 million songs covering new hits (Good for You, Cool for the Summer etc. ), familiar favorites and more in the section, it leads you to explore, stream and download wanted music for offline music enjoyment on any device, Windows Phone, iPhone, Android, Xbox and Web media player. Integrated with OneDrive, you can stream own music to from Windows 10 PC to devices using this app. Users can get free 30 day trial but pay $9.9 a month for further access. 1. 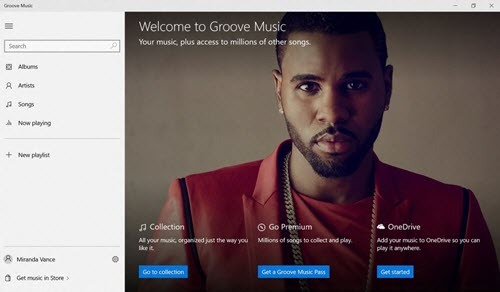 Sign up for Groove Music Pass and find the music you want to stream. 2. Enter info page of the chosen song/album. Click More option. 3. The Drop-down list appears. Click Download to have the music on your Windows 10 PC or other devices (only 5 at once). You can manage devices for music streaming by "Manage my devices" in "Setting". • Enjoy high-fidelity music streaming on Windows 10. • Access to a great deal of MP3/FLAC music in every genre. >> Downlod Music from Spotify • Listen to thousands of live radio stations for music, news, sports etc. • Customize own music stations from catalog of over 18 million songs. • Discover and stream free high-quality music videos, premieres, live performances from your favorite artist on Windows 10. Want to Get Free Movies/Music on Windows 10? As a matter of fact, most of movies/music app only allows you to enjoy movies/music online or pay for download and stream. If you want to free download movies/music on Windows 10 for a better offline playback, you can try to take advantage of free movie/music download software, for example WinX YouTube Downloader. If you still have some questions about how to download and watch movies on Windows 10, please go to Windows forum to post your issues and get help. ▪ Free download movies, music videos in SD/HD, even 4K/8K/3D from YouTube, Dailymotion, Metacafe, Vimeo and more at a high speed. ▪ Convert and stream downloaded movies/music videos (MKV, M2TS, H.265, MP4, AVI, WMV, MOV, FLV etc.) to devices iPhone, iPad, Android, Windows 10 for Phone, Surface Hub, PS3/4, Xbox etc, on Windows 10 or music MP3, WAV, FLAC, iPhone Ringtone and more with highest video/audio quality.